Slam is the competitive art of performance poetry, rapping or emceeing (with or without beatbox, but with no backing track), where artists slam it out over a hot microphone in front of a loud and lively audience – and a panel of judges made up of professionals in the field. 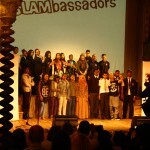 The Tower Hamlets Poetry Slam consists of a 2-day workshop in your school led by a well-known poet or spoken word artist. The first day will feature a performance from the poet, look at poetic techniques, writing stimulus, beatbox, and writing a poem or rap piece around the theme of Identity. The second day focuses on performance skills and rehearsals, leading to the filming of the completed poems – for uploading to the website for final judging. 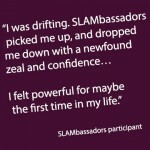 The Slam is about more than exploring poetry, it’s about your students exploring identity, self-expression and self-confidence. 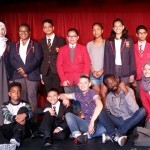 Over the years Tower Hamets schools have produced performance poets of incredible talent who have gone on to national acclaim. I learned who I am. I learned that my voice can be heard. The most valuable aspect was learning how to express feelings that you may not know you have. Joelle was great and taught us loads also it really improved my self-esteem; and I found out that dyslexia doesn’t stop you from doing everything. I learned how to make my feelings heard. I have found me. I have learned that I can be proud of my work. Sign up via your school’s SLA Online portal. Contact the Schools Library Services for more information about this event.